attention and time is needed. Don't try to make any design in a hurry and don't get disturbed if your design don't work. I recommend to have a piece of cotton and a nail polish remover, so where you feel the design is ruined rub it up and start it over again. I love to paint my nails and then i decided to take this as my profession and here i am now i am loving my work and i am able to make any design without. Different and unique kind of nail designs are available on internet, but you should try something new. Nail art is the only art that you can mold according to your own choice and can cvhange the pattern, design as you want and according to the event. The purpose of writing this post is to provide information and recommendations that how to change any design and how one can be creative in it's own nail art design. I want to thanks to the technology and the products that provide us ease to do nail art. 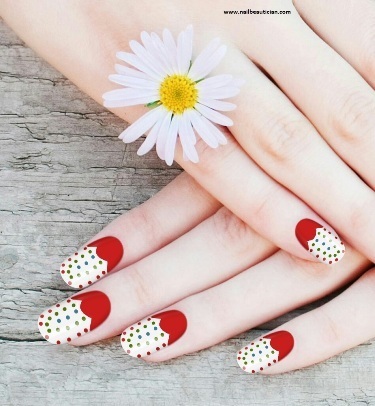 Tools such as dotting tools, pattern stickers, 3D stickers etc are the products that let anyone to do the best and perfect nail art on their nails. Different kind of accessories like jewellery, glitters etc all are for our comfort. In this article i will tell that how one can use these tools and how to make a simple nail art classy one. When i write simple nail art design, it doesn't mean that i will just show to put nail color or how to draw lines and patterns on it. The word simple is used because this nail art don't contain any jewellery items and don't contain any extra material. Some designs require stickers, and tools such as nail art pen etc. But i prefer in simple nail art designs to not use any tool and if needed then go for the house hold products like bobby pins, cotton bud, toothpick etc. This is because simple nail art design will be copied by beginners and they don't want to spend alot of money on the nail art tools. Yeah when they get experienced they can surely buy some.Here i am going to show some of the images of simple nail art design and will define it that how you can further make it classy and creative at the same time so read on to get more information. I created this nail art with the help of an app that i downloaded on my cellphone. I simply use two nail colors as you can see. One is peach color and other is lighter tone of grey. 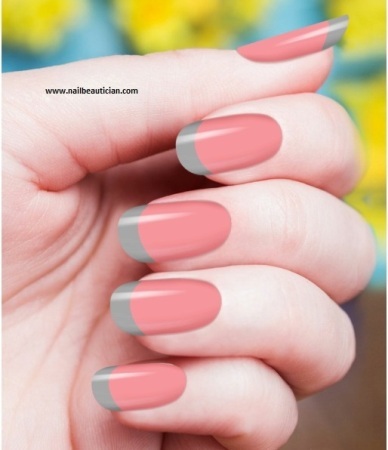 I simply put the peach color on whole nail and then apply the lighter tone of grey on the tip of nails. 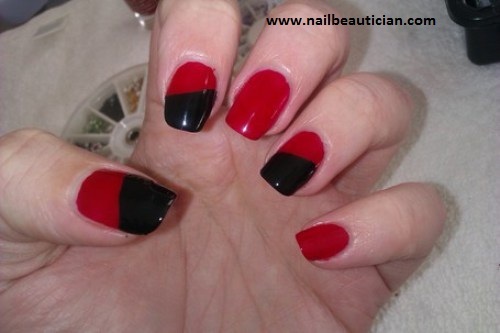 One can change the color combination as red nail color with black tips, black nails with white tips etc. It is upon you, i just show you an example and now it's upto you to customize it or not. This is the simple yet cute nail art and can be done on the nails of teenagers and on the nails of kids too. 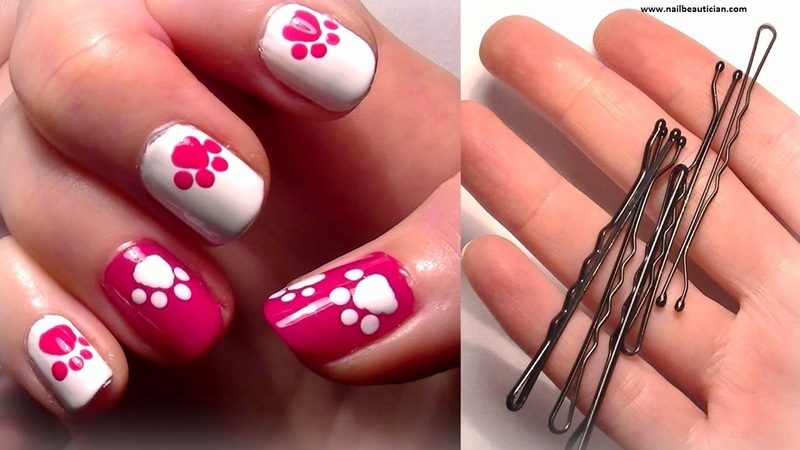 In this nail art i make paws of puppy on nails and put the base color white and pink. It is a great color combination of pink and white. The surprising part is i use bobby pins to make this nail art. 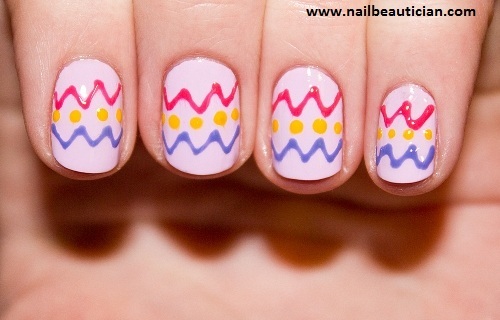 It is as easy as to put the nail color on the nails, so copy this design and make your nails trendy. This nail art is simple yet classy. Girls can easily carry it for any event and it will specially fit in for parties. I use two nail colors, one glitter. You can make the circles on the nails with the help of bobby pins and to make small circles try toothpick. I recommend to make this design with two color tones. As here i use black and gold you can choose pink and black, silver and black etc. It's a super cute nail art. Once you saw this nail art you think it's quite hard but it is as simple as other nail art designs. I put yellow nail color on the base and put horizontal black lines with black nail color (One can use black stripper too). Now for eyes of honey bee i make a big circle with black nail color, i use toothpick for making eyes and fill the black holes with white color and at end small eye balls was made up with toothpick. 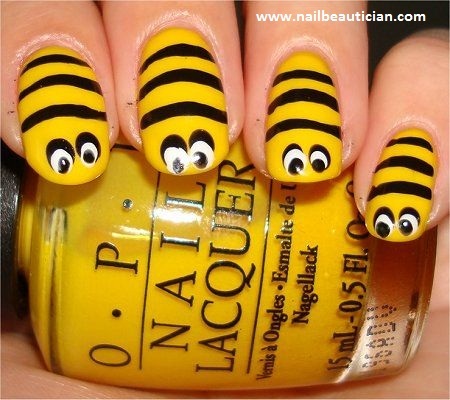 That's it you are done with the honey bee nail art. Kids will love this. This nail art is another classy design that can be carried by anyone and one can change the color combination according to their wish. I choose black and red nail colors because i personally love these colors and it look hot too. So you should name it "hot nails". I simple put red nail color as base on all nails and use black color vertically on thumb, index finger and ring finger. This look can be carried out in parties, school functions etc. This design has a great color combination yellow and pink. Pinks are the color for girls, so yong girls will love this nail design. I simply color all my nails with pink color and then put dots with the help of bobby pin on my index finger and on my ring finger i decided to make a bow with the help of toothpick. As the name suggest this nail art contains many colors that will attract others toward this nail art. 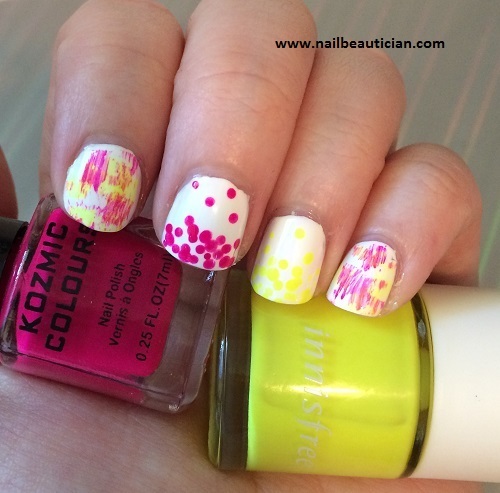 I use pink, yellow as main colors and white nail color as base. This nail art is perfect for the kids and for the yong girls too. 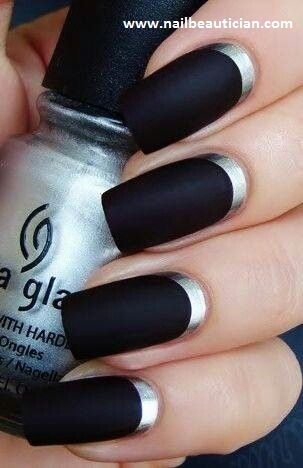 Matte nail colors are very popular now days. This is the simple and classy nail art design. I use silver nail color on the bottom of nail and covered the remaining nail with black nail color. It is quite elegant nail art design that can be carried on any event. You can change the black color and try some other matte nail color to customize this design. This is the trendiest design now days. People love the color tone as it is bright and fascinating too. I choose a blue nail color and make a design on the ring finger with the help of toothpick. The tip of the toothpick is thin so it works like nail art pen. You can create any other design such as white polka dots, drops etc. Another easy yet classy nail art design. In this nail art i design my thumb and ring finger make stars on the corner of nails with the black stripper or you can use toothpick too. You can make it on the small nails and on the long nails as well.